Review: Did you know that NASA is developing a printer that prints edible pizza? Did you know that 1.9 billion years ago planet Earth smelled like rotten eggs? 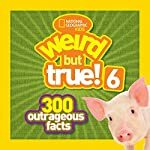 These are just are just some of the weird but true facts in the book Weird but True these facts that will catch you in awe. National Geographic Kids is at it again coming out with their sixth Weird but True book! This book has facts that will have you saying, unbelievable or no way but hasn't they all? Here is an example of why this book has some appalling facts! Did you know a prison in Brazil uses geese as an alarm system-they honk at anyone roaming the grounds! As you can see these books are easy and fun for kids to read. I think of them as scattered, colorful, yet informational encyclopedias. I personally enjoy Weird but True book they have had me since 2nd grade! These books are easy to understand so I recommend the age range of 2nd grade and up. These types of books are what make reading fun; so personally I give this book a 10 out of 10. One reason is how tied in you get into the book; this book has so many fun facts to learn; you can finish this book in possibly a day; I know I did! Also it's exciting one is how much you take away from it. You can learn so much from this book I hope you will check it out.